2 lessons today on scheduling that should take no more than 10 minutes each to learn. Once you have created an order you are immediately taken to the 'Order Overview' screen. From here you can control and see everything about this particular order. Notice the search bar in the top left. This is a very useful part of the system. Type customers names, order numbers, telephone numbers, postcodes, zip codes in here to find your customer. Making an appointment for a field visit. On the left hand side of the screen is the navigation menu for this order. Don't worry about anything else at the moment, just select the 'Appointments' button. 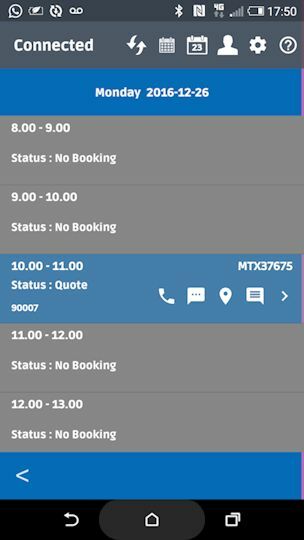 You will now come to a screen where you can see any previously booked appointments and add another. Click the '+' button on the right. 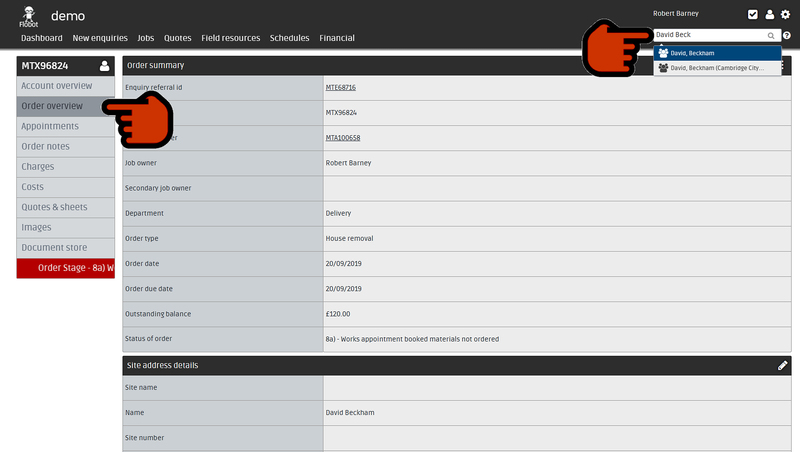 For this example we will select 'Quote or estimate' and select a time for the 'engineer' to go and visit the customer. If we like we can tell Flobot how long we think the meeting will last - then he can fit another in the hourly slot. But we don't have to (in the setting you can make the slot sizes any time. i.e daily, half day, 2 hours etc). You can see where your customer is on the map (in red) and where your engineer is in yellow (we call the engineers FTMs or Field Team Members). If you have lots of engineers in the field Flobot will select the best one (more on how it does this another time). 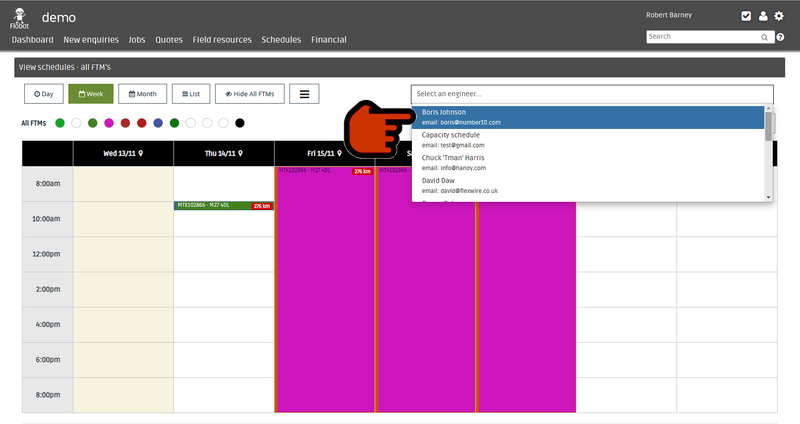 Click 'Confirm appointment' and you can now see that you have now made an appointment for your engineer or FTM to go to your customer at that time. If the engineer is using the app they will instantly have this information too. And here is what your engineer will see. Go here to see how the Flobot app works. Learn how to make an appointment that happens again and again. Often you need to create a regular appointment that might happen at a certain time every week, month or even year. We call this a 'Recurring Appointment'. Here's how to make one. Flobot will only select those field engineers that can do the job, are available to work and cover that area. Now select the day that the appointment or job is to begin and click 'Confirm'. The appointments have now been created. In this example an appointment that occurs all day every 4 days. You can see that it is a recurring appointment because it is purple. You can also mouseover the link to get details of the appointment. Again, it tells you that this is a recurring appointment. Most recurring appointments happen on the same day every week, bi-weekly or monthly. This is a key feature where Flobot excels in it's simplicity (just sayin'!). Just select a recurring time frame (e.g. weekly) and a day in the schedule and the appointment will recur on the same day every week. 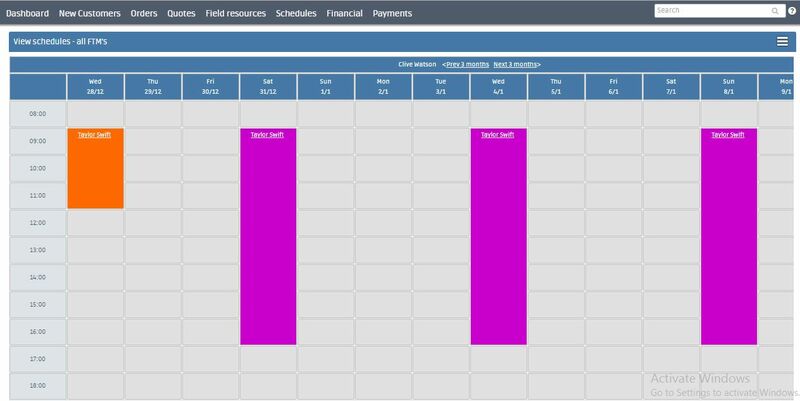 Practice making lots of appointments for your field team. So, making recurring appointments, jobs and quotes. They are all colour-coded in the schedule so you can quickly see who is going where and for what. Find tomorrow's lesson here .